The HEAD Challenge MP gives you a great combination of spin and power. 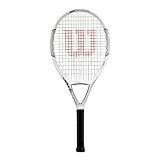 Exceptional value for a full graphite racquet at a fraction of the cost of other graphite racquets. Racquet is professionally strung by HEAD and ready to use. Includes full racquet cover.